This is just too strange and sad to be believed. Why would anyone want to inject cooking oil into their own face? This is what this Korean woman, who was addicted to plastic surgery actually did. Now she is unrecognisable. 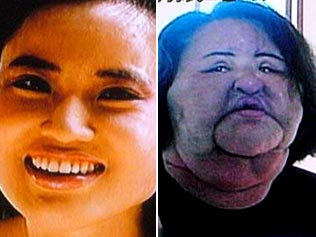 48 year-old Hang Mioku first underwent plastic surgery when she was just 28. She relocated to Japan after becoming hooked on the procedures, where she had further operations, most of them to her face. She underwent so many operations that her face eventually became enlarged and disfigured, but she would still look at herself in the mirror and think she was beautiful. After some time, her surgeon refused to perform any more work on her and suggested that her she should seek psychological help for her disorder. When she returned home to Korea, her features had changed so much that her own family couldn't even recognise her. Her parents took her to a doctor. Once again the possibility that Hang had a mental disorder was suggested and she finally sought the psychological assistance she required. However she could not afford to keep seeing the shrink. Unbelievably, she found a doctor who agreed to give her silicone injections. Even more amazing, is this doctor gave her a syringe and silicone of her own, so that she could inject herself at home. This is when things spiralled even more out of control - when she ran out of silicone, Ms Hang began injecting cooking oil into her face. Her face became so strange and grossly large (on such a small body), that local children started calling her "standing fan". Ms Hang was recently featured on Korean TV. Viewers felt so sorry for her plight, that enough donations were raised so as to enable her to have surgery to reduce the size of her face. In the first operation, surgeons removed 60g of foreign substance from Hang's face and 200g from her neck. After many more sessions, her face has been left much smaller, but still very scarred and disfigured. She now see the problems she has caused for herself - she now says that she would like to have her own original face back. feel sorry for her...but why cooking oil? who or why was this suggested instead of silicone?